All CustomerHub users are required to complete the steps below by April 17, 2019 to avoid disruption of CustomerHub service. Once signed in, it will take you into CustomerHub where you can finish the steps on screen to complete our new login. 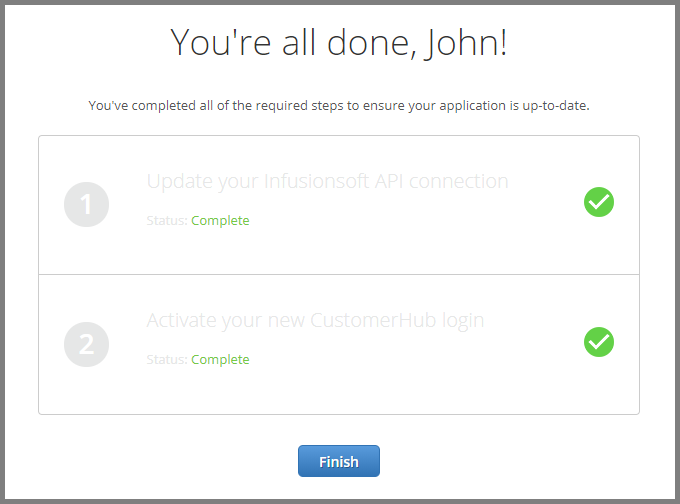 Due to the recent change in ownership of CustomerHub (see announcement) you will need to update both your Infusionsoft API connection method and CustomerHub login information in order to continue using your CustomerHub application beyond February 28, 2019. 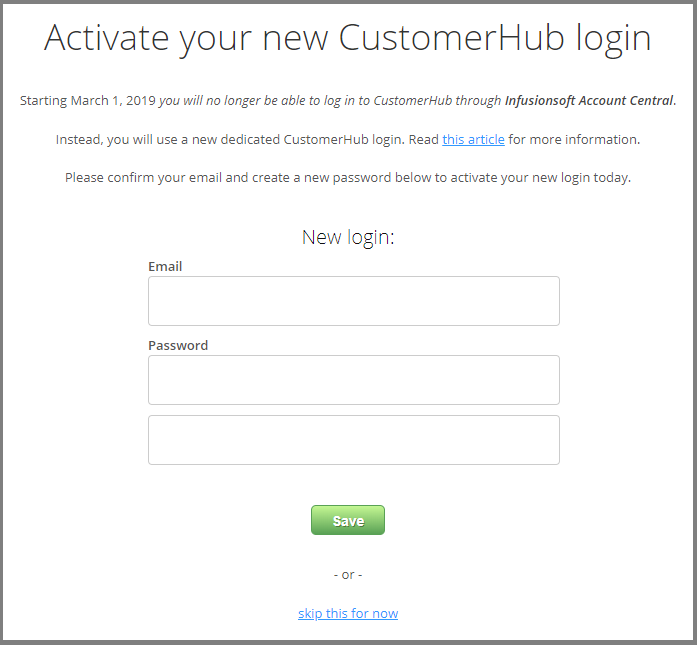 Consequently, this also means that you will use a dedicated CustomerHub login page moving forward and will no longer be able to log in using your Infusionsoft ID (including both Account Central and the User Account drop-down in your Infusionsoft application). We will provide the new login URL to you upon completing the steps below. The required actions below will automatically be presented to any and all necessary CustomerHub users upon their first login following the 1/23/19 update and on each subsequent login until all actions have been completed. 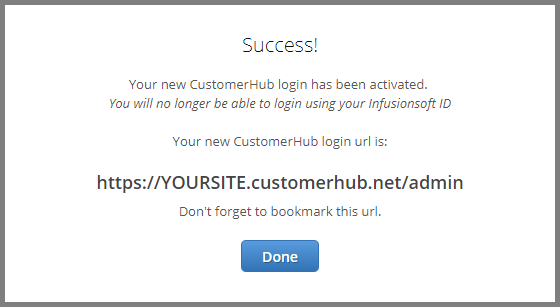 Note: We recommend that you write down or bookmark your new CustomerHub login URL (https://<yourapp>.customerhub.net/admin) for easy future reference since you will no longer be able to access CustomerHub using your Infusionsoft ID. Don't forget to bookmark your new log-in URL. IMPORTANT NOTE: This requirement applies to CustomerHub admin users only and does NOT impact CustomerHub members (i.e. your customers with logins). Members should continue to use their existing login credentials and are not required to take any action.